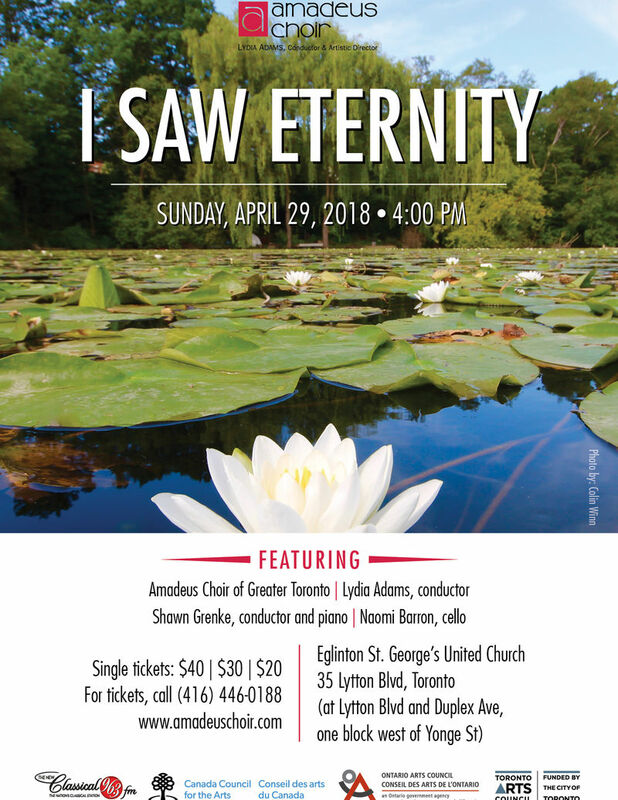 Artistic Director and Conductor Lydia Adams and Associate Conductor Shawn Grenke lead the choir in this performance of mystical music on themes of eternity by contemporary Canadian and international composers Eleanor Daley, Imant Raminsh, Hussein Janmohamed, Stephen Chatman, Leonard Enns, Eric Whitacre, Ola Gjeilo, Morten Lauridsen, Bob Chilcott, and the timeless Healey Willan and J.S. Bach. The choir will be joined by cellist Bryan Holt and pianist Eunseong Cho. The concert will be enhanced by a multimedia presentation of the stunning nature photography of Colin Winn, produced by Ed Mock. The Amadeus Choir will announce the details of its 2018-2019 season at this concert.